Interests:Old things, ephemera, antiques, shiny bits. So I was unpacking a bin full of railroad and auto paper, and this reared it's head down at the bottom. Nice! What does it say on the back? Edit: oops, skipped past the link. Thanks! Very nice, first one I've seen. Interesting, one sold on ebay on April 24th for $289, with 6 active bidders. 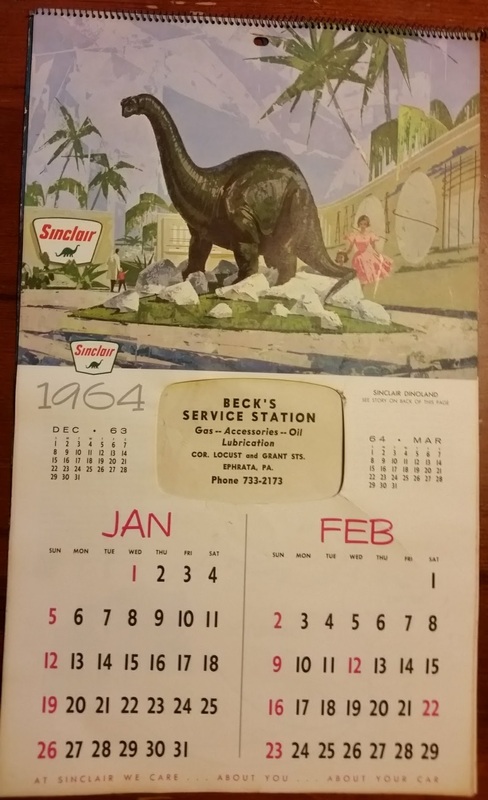 Ebay item # 323215628119 (Vintage 1964 Sinclair Dinosaur Dinoland NY World's Fair Calendar DEALER AD). That's the only other one I've found anywhere so far, except one in a private collection not for sale. Mine is available for $315, shipped BOXED within the U.S. PayPal only. This is listed in two other venues, one dealing with ephemera and one gas-n-oil collector venue. The calendar is still available, just slipped to the back burner.